A 14-year-old Mahopac boy suffered massive head trauma Monday evening when struck by a car as he skateboarded near his home. Carmel Police identified the victim as Michael Bongiovanni. 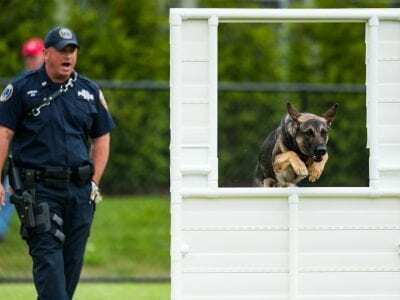 Chief Michael Cazzari said members of his department received th… Please login below or purchase a subscription to the Putnam County Courier to access this content. Howard Buzzutto receives congratulations and warm handshakes from fellow veterans. 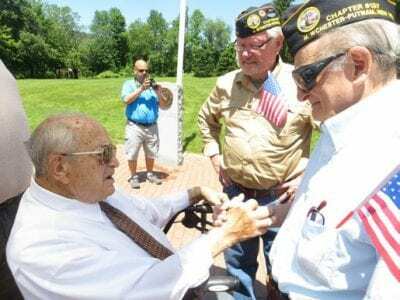 It took more than 70 years for Howard Buzzutto to be acknowledged as an American hero but on Monday, D-Day, the soon-to-be 91 year old Patterson resident received his … Please login below or purchase a subscription to the Putnam County Courier to access this content. 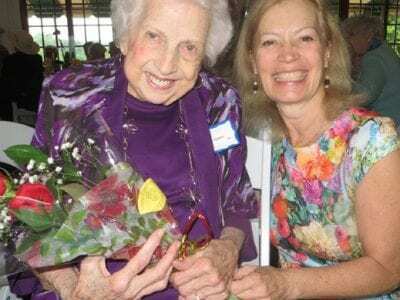 Michelle Piazza presents a bouquet of flowers to Greta Upham, Putnam’s NUMBER ONE volunteer, at Friday’s Putnam Hospital Center Volunteer Recognition Luncheon. Volunteers came in many shapes and forms throughout Putnam County. People volu… Please login below or purchase a subscription to the Putnam County Courier to access this content. 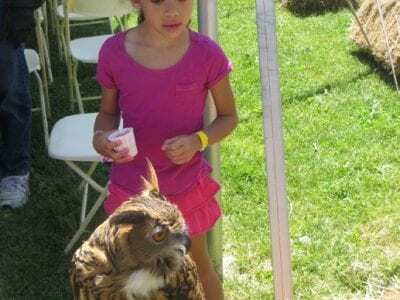 Above: Xena, an owl, poses with five year old Tabitha Salerno of Carmel. At left: Charlie Koop of Putnam Valley and his magnificent Harris hawk, “Dusty.” The Green Chimneys campus was a bit muddy Sunday due to intermittent rain squalls bu… Please login below or purchase a subscription to the Putnam County Courier to access this content. Partners with PARC hosted its 10th Annual Secret Garden Tour on Saturday, June 4. The event, a fundraiser for people with disabilities, raised just over $10,000 and hosted over 350 guests. The day-long event featured tours of eight private gardens … Please login below or purchase a subscription to the Putnam County Courier to access this content. The Putnam Valley Library is going to try again to get the referendum passed this year after last year’s failed attempt that had to be withdrawn because of substantial errors in their figures. They will be coming around to your homes and businesses … Please login below or purchase a subscription to the Putnam County Courier to access this content. The warm weather has arrived and since Putnam County has already reported its first case of Zika virus, local health officials met with town supervisors across the county last week to coordinate efforts for mosquito education and control. Acting He… Please login below or purchase a subscription to the Putnam County Courier to access this content. Tax Break: Will The Fifth Time Be The Charm? 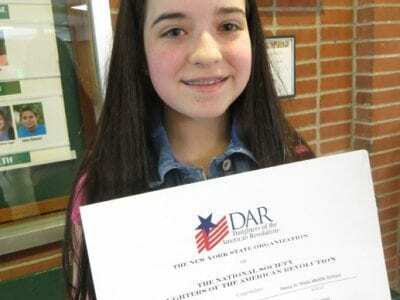 After four rejections in the NYS Assembly, Putnam lawmakers are hoping that local shoppers will be getting a tax break this fall on back to school clothing and footwear. The legislature Tuesday evening authorized County Executive MaryEllen Odell to … Please login below or purchase a subscription to the Putnam County Courier to access this content.